I'm a crafty person. Always have been. As a child and teen, I used to make jewelry, pottery, and even altered my doll's and my own clothing. Making things can be such a fun hobby. As an adult I haven't been able to do it as often, but now that my children are a bit older, I have a little more free time to get creative. Have you ever made your own headbands? Check out this cool little headband making kit from Working Class. 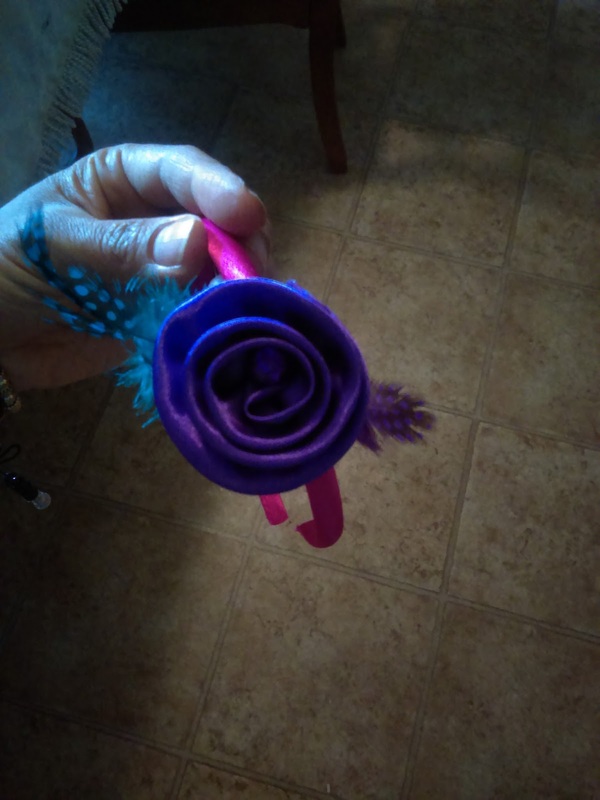 The kit includes a 10 colorful headbands, glue dot sheets, flowers, feathers, a butterfly, stick on rhinestones, glue stick, elastic bands, and colorful ribbons. This is one of my favorites. I used a purple headband, added some pink ribbon, pink and purple feathers, a pink flower, and a couple of rhinestones. I used some glue dots and an elastic band to attach everything. For this one I used some of the bigger ribbon and just cut it into smaller strips. Then I made a quick little flower and added a stick on rhinestone. 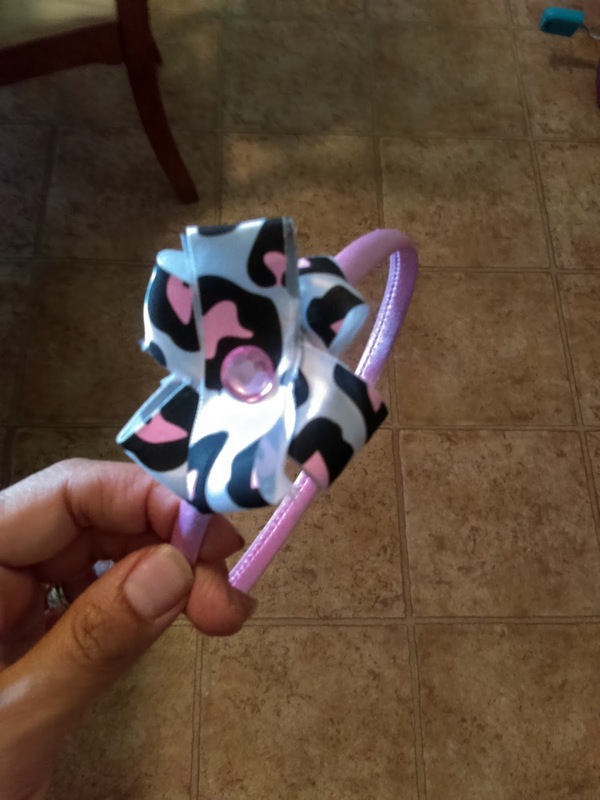 I didn't add any other ribbon to the already pink headband. I used several of the tiny glue dots and a tiny bit of the glue stick to hold everything together. It was so simple to make and it came out looking pretty cute. This was another very simple one to make. 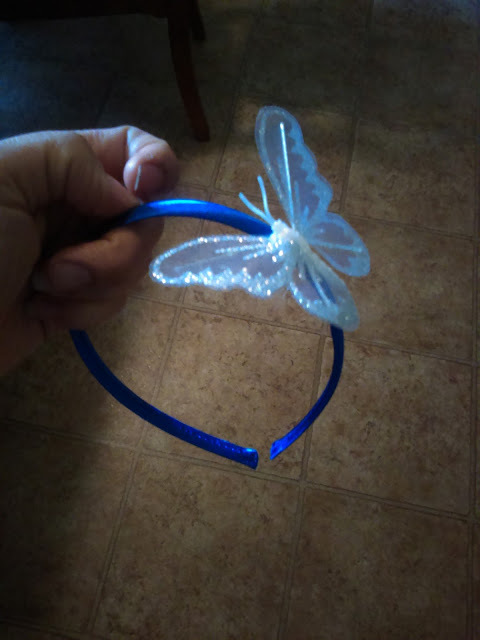 I like the butterfly that came in the box, so I chose the blue headband and attached with a couple of the glue dots. This one was a little flimsier. I still think that it turned out cute, especially when it is on my daughter's head. 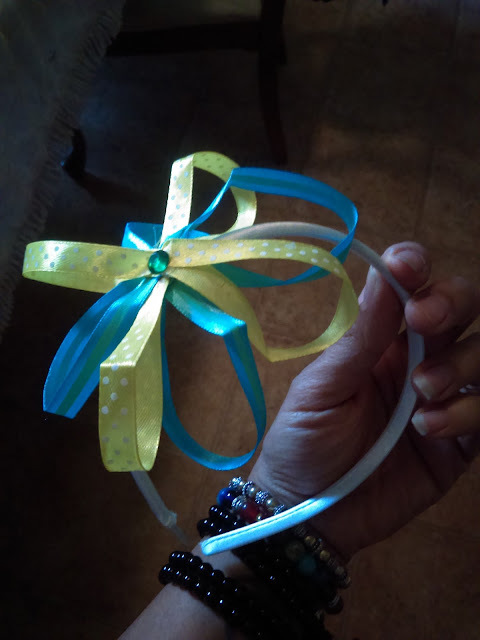 I used two contrasting ribbons--a blue striped one and yellow one with polka dots. I cut them into smaller strips and made a flower. Then I attached a tiny green rhinestone in the middle. 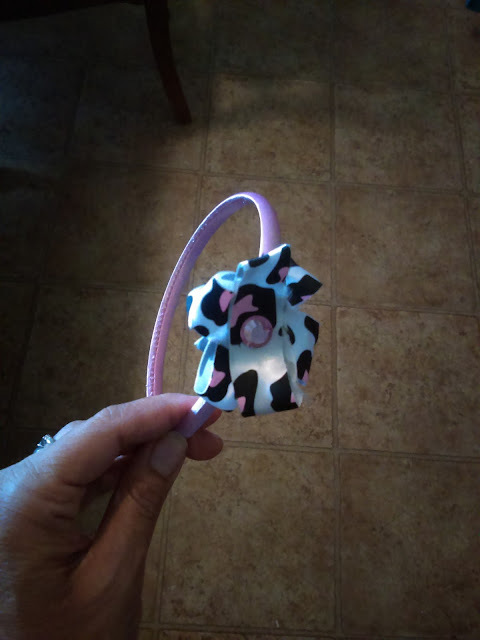 I used several glue dots to attach this one to a white headband. 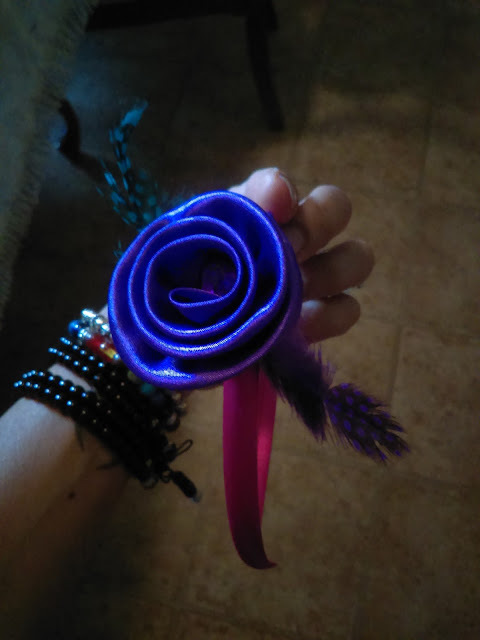 For this one I chose the bright pink headband and like the first one I made, I added a flower and two different colored feathers. I used some of the glue from the glue stick, as well as glue dots. For some reason you can't see it, but there is also a pretty little rhinestone in the middle of the flower. I really wanted to make one for Halloween, so this is what I came up with. 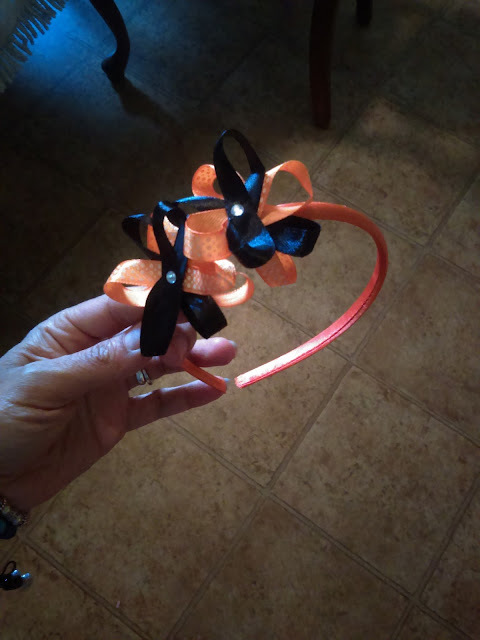 I used the orange polka dot ribbon and black ribbon, cut them into really small strips, and made two little loopy flowers. Then, I attached a little clear rhinestone on each one. 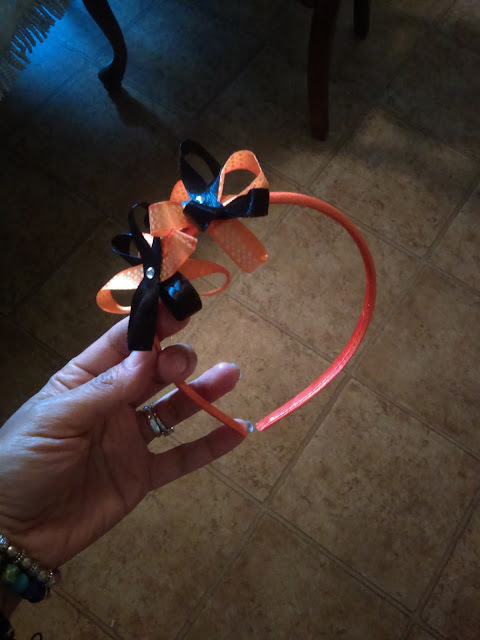 I used several glue dots to hold everything together on the bright orange headband. 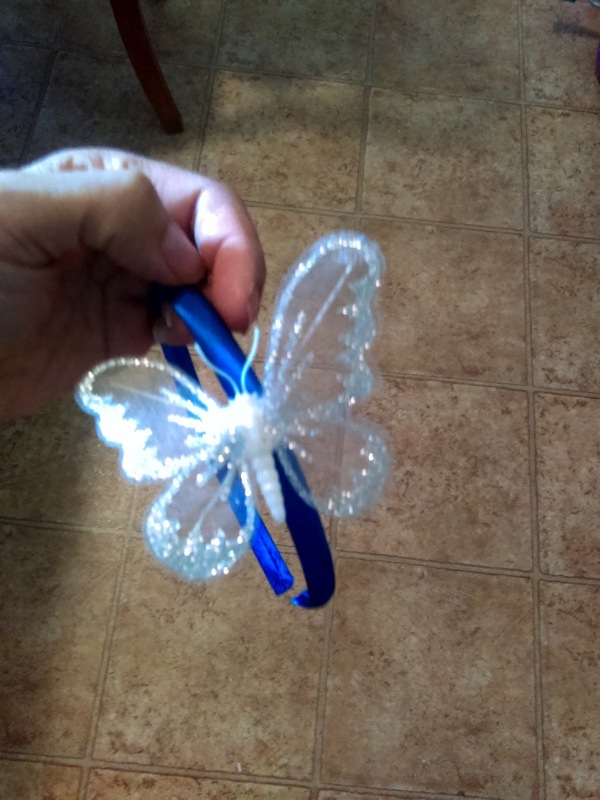 I have four more headbands, some leftover ribbon, rhinestones, a feather, and an elastic band so that I can make even more. I'm excited to see what I'll end up coming up with. I honestly did have a lot of fun working on this project. 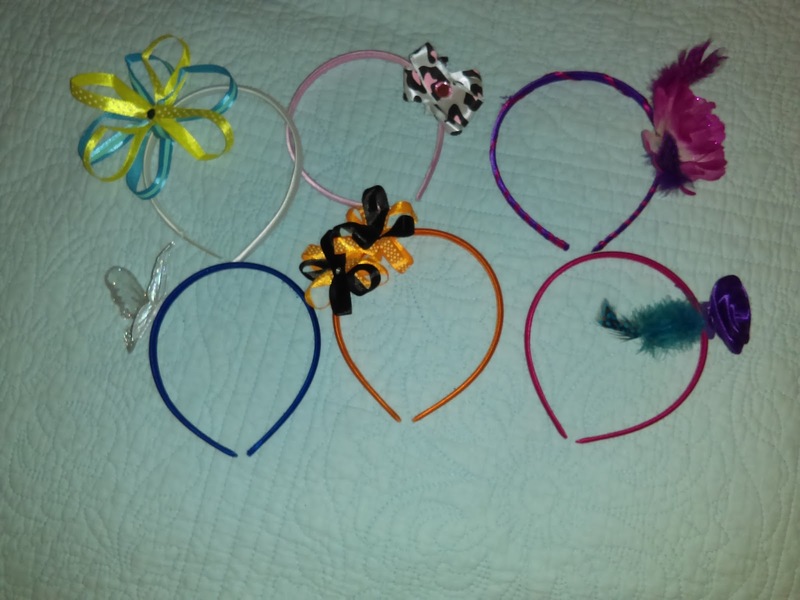 My daughter was running around wearing each of the headbands, so it's obvious that she loves them as well. I wanted to take pictures of her wearing them, but she just would not stay still. Perhaps I'll make a video of her wearing each one. This is such a great product to give as a gift for the upcoming holiday season or for a birthday.